On April 19, 1995, at 9:02 a.m. a forty-eight-hundred-pound ammonium nitrate–fuel oil bomb exploded in a Ryder truck parked at the north entrance of the Alfred P. Murrah Federal Building in downtown Oklahoma City, killing 168 people and injuring approximately 850. The governor's office reported that thirty children were orphaned, 219 children lost at least one parent, 462 people were left homeless, and seven thousand people lost their workplace. The City of Oklahoma City's Final Report estimated property damage to more than three hundred buildings in a forty-eight-square-block area. Reckless media accusations that the perpetrators were Islamic terrorists led to two days of intensive anti-Muslim hysteria throughout the nation. The arrests of Timothy McVeigh and Terry Nichols, however, brought the uncomfortable realization that the perpetrators were military veterans of the Gulf War who found persuasive the conspiratorial world view of militia culture and viewed the bombing as a justifiable attack against the federal government of the United States, in which the murder of innocents was characterized, in McVeigh's words, as "collateral damage." Both were indicted in U.S. District Court for the Western District of Oklahoma on August 10, 1995, on conspiracy to use a weapon of mass destruction, use of such a weapon, destruction by explosive, and eight counts of first-degree murder. Accomplice Michael J. Fortier was also indicted on four counts, including conspiracy to transport stolen firearms. McVeigh was found guilty on all counts on June 2, 1997, and executed on June 11, 2001. Terry Nichols was found guilty of conspiracy and manslaughter on December 24, 1997, and sentenced to life in prison with no parole. Fortier was sentenced to twelve years in prison on May 27, 1998. The bombing was the nation's worst single act of domestic terrorism (superceded in numbers of dead only by the attack on the World Trade Center on September 11, 2001, in New York City). Intensive and enduring media coverage created an imagined bereaved community in which people around the world felt emotionally connected with the deceaseds' grieving family members, who often appeared on television to eulogize their loved ones, with bloodied survivors who related their harrowing stories of escape and rescue attempts of fellow workers and friends, and with professional rescuers, whose grim work turned almost immediately from rescue of the living to the recovery of the dead. Four master narratives helped people locate the bombing in a coherent interpretive context. There was a "progressive narrative" that celebrated the "Oklahoma standard," the selfless actions of thousands of people who sought to help in countless ways. This narrative envisioned a city revitalized by its courageous response, recommitting itself to massive programs of urban renewal and other acts of civic enrichment. A "redemptive narrative" emerged in this overwhelmingly conservative Protestant city, as religious communities struggled with issues of forgiveness, doubt, and the presence, or absence, of God and Jesus Christ. Popular religiosity proclaimed the presence of angels hovering above the ruins and assisting people in their journey to the heavenly world, convictions that were also often expressed in material items left on the commemorative fence that surrounded the site. A "toxic narrative" also emerged out of the bomb's enduring impact on the bodies and souls of so many. It is a story of an unfinished bombing, as suffering and unresolved grief offered a sobering counterpoint to those who too easily used pop psychology language of "closure" and "healing." There are, this narrative sadly cautioned, events that must be endured and not resolved. Hence the popularity among family members and survivors of the term, "the new normal." Finally, a "traumatic narrative" transformed people who were affected by political violence into "patients" suffering from post-traumatic stress syndrome. Unlike religious narratives of suffering, sorrow, and hope, this narrative did not speak of sin or injustice, but of a weak and passive self beset by parasitic traumatic memories. Even among those most seared by loss, the labels of "victims" and "patients" did not always sit well, and many family members and survivors turned to various forms of active grief to respond to the bombing: through work for habeas corpus reform, pro- and anti-death-penalty activism, expression through the arts, and work for victims' rights, and through participation in private and public forms of memorialization. Unsolicited memorial ideas poured into Oklahoma City within days of the bombing, and by July 1995 the Oklahoma City Murrah Federal Building Memorial Task Force was formed, made up of ten committees and an advisory committee of 160 people. Chaired by Oklahoma City attorney Robert Johnson, the Task Force began by creating a mission statement that declared the memorial's purpose would be to "remember those who were killed, those who survived and those changed forever." The Task Force (eventually the Oklahoma City National Memorial Foundation) had to negotiate difficult issues. They had to convince the city to close Fifth Street, which ran in front of the Murrah Site, in order to create a large memorial area. A subcommittee struggled to define who was a "survivor," since the mission statement called for survivors' names to be placed on the site as well as the names of those murdered. And they had to create a design competition for the physical memorial. After a two-stage selection process, on June 24, 1997, a fifteen-member selection committee, which included eight family members and survivors, selected the design of Hans and Torrey Butzer from more than six hundred submissions. Large "gates of time," one marked "9:01" and the other "9:03," froze the time of the bombing on the site. The area included the Survivor Tree and the Journal Record Building, which houses a museum, archives, and research center for the prevention of terrorism, mounted tablets with survivors' names, a long, shallow reflecting pool, and perhaps the most distinctive feature, 168 lighted chairs marked by the names of those murdered. Like the United States Holocaust Memorial Museum, the Oklahoma City National Memorial is an environment that offers not only commemorative mourning space, but through a museum exhibition, educational programs, and research opportunities, offers protest against acts of violence. Unlike any other major memorial project up to that time, however, its process was unique, always offering a primary voice in deliberations to family members and survivors, and offering a bereaved community the opportunity to engage the tragedy through the creation of a distinctive memorial. Alfred P. Murrah Federal Building Bombing, April 19, 1995 (Oklahoma City: City of Oklahoma City, 1996). 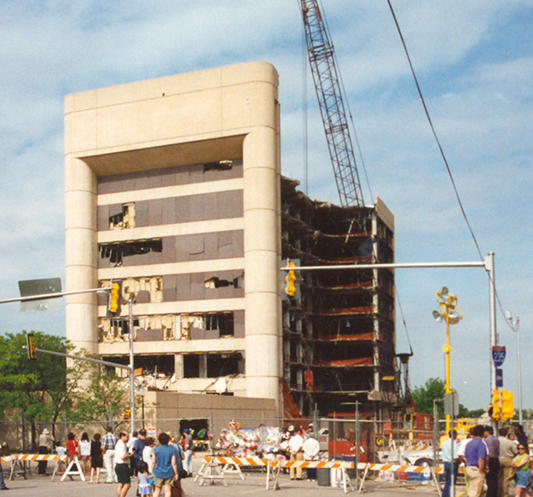 Final Report on the Bombing of the Alfred P. Murrah Building: April 19, 1995 (N.p. : Oklahoma Bombing Investigation Committee, 2001). Clive Irving, In Their Name (New York: Random House, 1995). Marsha Kight, comp., Forever Changed: Remembering Oklahoma City, April 19, 1995 (Amherst, N.Y.: Prometheus Books, 1998). Edward T. Linenthal, The Unfinished Bombing: Oklahoma City in American Memory (New York: Oxford University Press, 2001). Austin T. Turk, "Oklahoma City Bombing," in Violence in America: An Encyclopedia, ed. Ronald Gottesman (New York: Charles Scribner's Sons, 1999). Edward Tabor Linenthal, "Oklahoma City Bombing," The Encyclopedia of Oklahoma History and Culture, https://www.okhistory.org/publications/enc/entry.php?entry=OK026.